South Korean rapper finds no respite from controversies in spite of his lyrical clarifications. n E has landed in trouble yet again for mocking feminists onstage and for using abusive language against the audience during a concert. 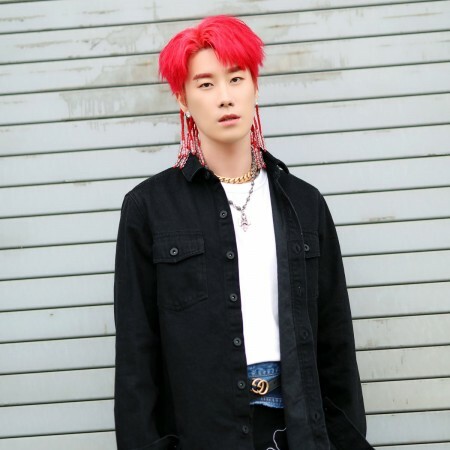 On December 2, San E was slated to perform at the Brand New Year 2018 concert. The rapper reportedly used expletive freely before rapping in English in front of nearly 5,000 spectators. The rapper said "womad is poison. Feminist, no. You're mental illness". Womad and Megal (aka Megalia) refer to controversial, radical feminist online communities in South Korea. Oblivious to the stir he created, the rapper proceeded to spew politically charged comments supporting "normal women" and criticizing Womad and Megalia as "male-bashing". The audience expressed their displeasure during the break of the Sunday concert as few members of the audience reprimanded the rapper for his strong views on gender issues. The mob held placards criticizing the rapper during the performance and hurled a stuffed pig doll bearing an offensive message on him. The unapologetic rapper said: "I don't think there's a need for me to respect you if you're not going to respect me". He stated that "Everyone paid to be here, but you don't enter a restaurant to cause a riot. I wish you all can create a fan culture where you don't abuse your power. I don't care how much you attack me. I support sane women. Womad and Megal are evils of society". Due to the sudden outburst, the concert was cancelled midway. The CEO of Brand New Music, Rhymer, took to the stage and apologized on behalf of San E. He further stated that "All Brand New Music artists think different. Everyone can have their own thoughts, beliefs and conscience. We will continue to project their thoughts. Our music and thoughts may differ but we are one." Further to the repeated controversy surrounding Feminist, the public is awaiting his new song "Oong Ang Oong" which literally translates to "Whining". It is for us to wait and watch what controversies will surround the new upcoming release.